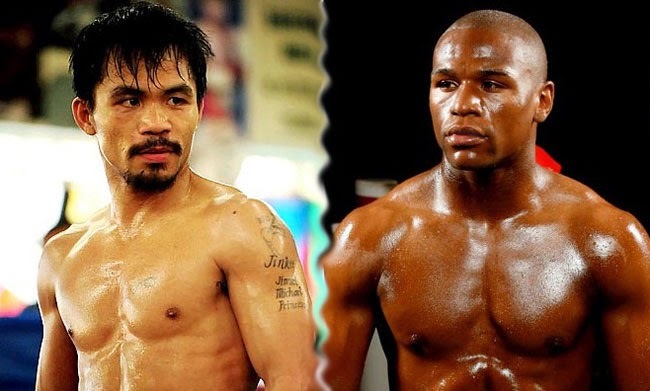 Floyd Mayweather Jr agrees to fight Manny Pacquiao on May 2, 2015, the Cinco de Mayo and this confirms that the dubbed ‘megafight’ boxing fans are wishing for will finally happen. This coming Christmas, boxing fans received a gift, Mayweather’s agreement to fight Pacquiao. According to ESPN, Mayweather Jr had been saying little about the actual fight with the Filipino Boxing Champion until on December 12, he said that he is ready to fight. After Pacquiao had defeated American boxer Chris Algieri on November 22, Pacman’s camp and Top Rank promoter Bob Arum had been very verbal and aggressive over their desire to have the megafight. Pacman also said that the bout has to happen for the boxing fans. For the first time, Mayweather had openly talked about the anticipated fight and even voiced out about the specific date. He shared that he had wanted to fight Pacqiao but certain problems such as random urine and blood test got into the way. He even called Pacquiao desperate citing Filipino champ’s loses and low Pay-per-view figures. The undisputed Boxer said tha fight must happen in Showtime Pay-per-view in which has a contract with. Mayweather Jr said that it was Bob Arum who did not want the fight. He said that people had been fooled and it was indeed his camp who had been wanting the fight all along. As reported by ESPN, Mayweather had voiced out that he has been motivated by the fans and he had wanted the fight before he retires. During the interview, he accused Pacquiao and Arum to be ducking the fight and said that because Pacman’s camp didn’t want to do the random lab tests and declined his $40 million offer the fight took long to become a reality. Pacquiao’s camp is yet to make a statement regarding Mayweather’s words but the bxing fans will surely look forward for the megafight of Pacquiao versus Mayweather Jr.